Knitted mesh gaskets are formed by knitting Monel, Aluminium, Stainless Steel or Tin plated Copper clad Steel wire into continuous sections or strips. Using this technique a range of tough, resilient gasket sections can produced that as a result of the high number direct metal to metal contact points also offer excellent shielding performance. 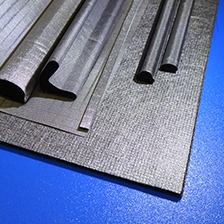 Knitted wire mesh gaskets do not offer any environmental sealing on their own but can be combined with conventional elastomer gasket sections to provide both EMI shielding and environmental sealing to any required level. Please see out Twinshield section for more information. Knitted mesh may be formed into various cross-sections, usually square, rectangular or round. Such sections offer very good shielding performance due to their high metal density and but require a relatively high compression force. Very often these sections are bonded to sponge rubber carrier strips to form combined seals and the overall compression force required is minimised by keeping the knitted mesh section small. 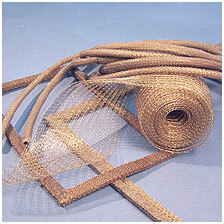 Knitted mesh lengths can be joined to form complete gaskets. 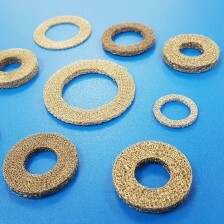 Small compressed mesh gaskets in the form of washers, contact (fuzz) buttons, cylinders etc can be made by forming knitted meshed using a compression tool. 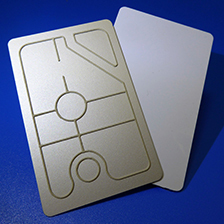 These gaskets provide robust, reliable contact and are ideal for grounding applications. These gasket sections are produced by knitting wire directly over extruded elastomer cores. This gives a gasket section that has the combined benefits of good shielding performance that knitted mesh provides along with the compliance and low compression set of the elastomer core. Typically, sponge or tubular elastomer cores are used for their high compressibility. Knitted mesh can be formed into a strip or tape up to 300mm in width, although more typically 20mm to 100mm. 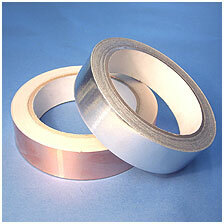 In this form it is ideally suited to cable shielding whereby the tape may be ‘opened’ to a allow a cable to be threaded through or for a higher level of shielding the tape can be wound on spirally half overlapping (racing bicycle handlebar tape style). Knitted mesh gaskets and where required in combination with environmental seals, can be affixed to an aluminium alloy frame. This is turn can be pre-drilled allowing a gasket assembly to be easily mounted or changed as required. The gasket sections are securely held eliminating the need to incorporate this feature on the enclosure/aperture itself.